The page for Ryan’s Buffet menu prices. Ryan’s Buffet is a restaurant that provides great-tasting food that you would be proud to serve your friends and family. Ryan’s offers handmade favorites in a welcoming atmosphere at a great price. Ryan’s Buffet was also named the “Top Family Steakhouse in America” 10 years in a row. Ryan’s offers a wide variety of choices for breakfast, lunch, or dinner. In addition, Ryan’s offers delicious grill selections from the open-flame grill, a fresh salad bar, hot vegetables, and a sumptuous dessert bar. Below are the latest Ryan’s buffet menu prices. Alvin A. McCall established Ryan’s in 1977. Ryan’s is currently part of Ovation Brands group of restaurants. Currently, there are more than 200 Ryan’s restaurants in 23 states. This restaurant’s headquarters is located in Greer, South Carolina, although its operations are primarily based in the Midwestern and Southern United States. This restaurant has enjoyed much success ever since its establishment. It has received many accolades from the restaurant industry. 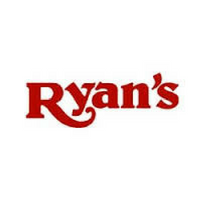 One of the best rewards it received was for being the “Best Small Companies in America.” Ryan’s has been granted this distinction for seven consecutive years. Members of the Crave Connections Reward program receive special offers, discounts, and deals sent directly to an email address. Some favorite menu items at Ryan’s include Hand-Breaded Fried Chicken, Fresh Made Macaroni and Cheese, Baked Fish, Baked Chicken and Fried Fish. For dessert, you will love Ryan’s Dessert Central concept. A varied selection that includes cakes, pies and ice cream sundaes. On Saturdays and Sundays, Ryan’s serves hot and cold breakfast choices that include pancakes, eggs, assorted pastries, and waffles. During Family Nights, your kids can enjoy their meals at only $1.99 per head including sodas. For more information about Ryan’s Buffet, visit their official website. Ryan’s offers the crappiest Senior Discount. Not even 10%. Now they have a special for Military one night a week. Senior Discount should be more and Military Discount should be every day, after all, they are not Military only 1 day a week. Me, as a Senior, will not go back. There are Restaurants that honor our Seniors and Military in a more appropriate way! u will when u get ur social security and try to live on it and go out every so often and not be extravagant, because u can’t afford it, let alone pay for all ur medicine and rent and utilities on what SS gives u. Good luck when u get old. We have paid our dues to get old. You make more money then us Blake, or at least have the opportunity to due so, we do not, and most of us live on a fixed income. Restaurants in general are a rip. Ryans serves the nastiest buffett in history and they used to be famous for good steaks. seniors don’t eat as much either. We absolutely loved it !!! AT 74 I DON’T EAT AS MUCH AS I DID AT 50 . ALSO WHEN I WAS WORKING MY PAY SCALE WASN’T AS HIGH AS IT IS TODAY SO MY RETIREMENT IS NOT AS MUCH. I HAVE TO WATCH HOW I SPEND ON EATING OUT SO ALL DISCOUNTS ADD UP AND HELP ME DECIDE WHERE I CAN EAT. ONE OF THE BEST SUNDAY LUNCH DEALS IS [DORIS HEART AND SOUL] MILTON ,FL..IT’S NOT A BUFFET BUT IV’E NEVER LEFT HUNGRY AND USUALLY TAKE SOME HOME. $9.00 WITH COUPON..
Military should get a discount 365 days a year especially for what they do and how they are treated by you the public when they return you pack of entitled babies. And if you don’t like there senior discount then eat elsewhere and yes I’m a senior. I don’t want to be treated differently because of my age,,,senior, tween or teen,,,I want to be a normal person and treated normally…Just want to be a normal, thankful blessed by God person… I really don’t want people asking me if I want a Senior Discount. i find it offensive,,,So as you can see people vary on how they feel about it from all different angles. I know you can’t please everyone….Just be thankful for everything and everyone. All people do is complain…yes I feel that Seniors should get a larger discount along with our Vets….when the people born in the 70’s on SS probably be obsolete …..so let them all enjoy it…especially our VETS…do ya all Thank Them when you see or meet one???? I certainly hope so…. Had Thanksgiving dinner at Ryan’s, it was very good. The place was packed but the wait was not long. So glad we went.